I meant to update after my doctor’s visit yesterday about how everything is going. I am 16 weeks and 2 days in the picture above (taken today). I went to see my doctor yesterday after the snow cancelled my appointment last week. I saw Tia this week, Dr. T’s new nurse practitioner. I like her. 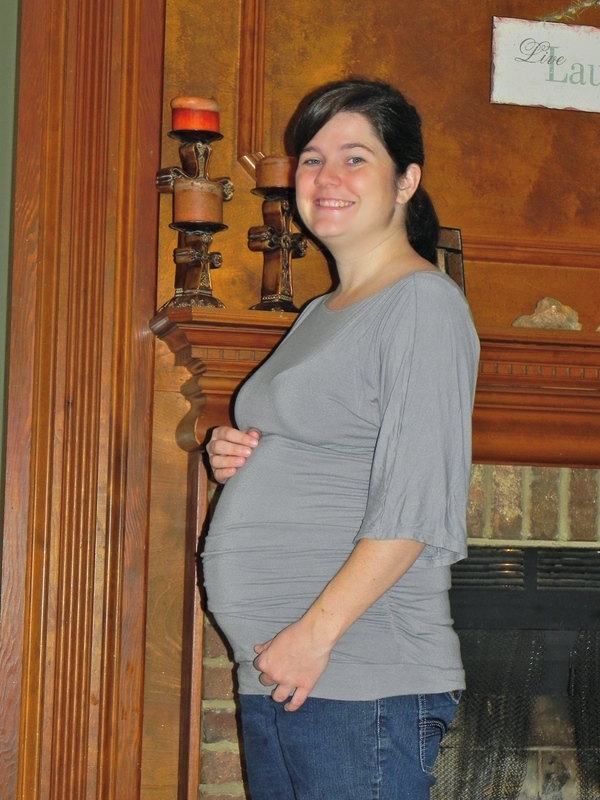 I had been warned that she is a little obsessive about weight gain in pregnancy, so I was nervous that I was going to have gained too much. But, I actually lost a little in the past month, so I’m up to a grand weight gain of 1 and a half pounds so far in this pregnancy. I’m not sure how that is even possible since I feel so much bigger than before. And not bigger in a cute, my-belly-is-big-and-cute, way but in a I-look-like-I’ve-been-packing-away-too-many-Twinkies way. Not cute at all. But I haven’t gained weight and I have been eating well. (Although I do have a new obsession with frozen yogurt, but it is LOW FAT, so back off.) I declined all the typical screening stuff, since I wasn’t willing to do any follow up on it. (Read: I am not, under any circumstances, getting an amnio. So any poor results from blood test would just have to wait until the big day to see if they’re right or wrong. No real point in that.) Everything looks great with the baby. Imogene went with us to the appointment and got to see baby Charlie on ultrasound. She kept asking me if everything tickled. She thought ultrasound gel was hilarious. She kept waving at the baby on the screen. She even asked Tia why the picture wasn’t very good. She then informed Tia that her book (“From Conception To Birth”) has much better pictures. So, what is next? Well, I started exercising more. Hopefully I can keep up a good schedule and keep it up. Healthy mommy = healthy baby. We are deciding if we will or won’t do the 20 weeks anatomy screen. I’d love the nice ultrasound, but I’m not sure I’d like to talk to another doctor. Doesn’t sound so fun. We are looking for a doula. Hopefully we’ll secure someone before too long. And I’m going to keep up the good work on eating well. Hopefully I’ll start looking more pregnant than just fat. 16 weeks and NO ONE in public has asked if I’m expecting. Not a single mom at ballet has noticed. I’m beginning to get a complex.